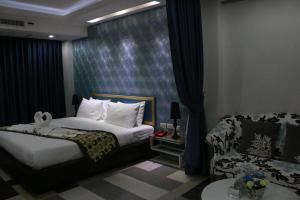 Set in the Pathumwan district of Bangkok, Pratunam Casa Hotel is 200 metres from Wholesale Market (Pratunam). This property is situated a short distance from attractions such as Central World Plaza, Gaysorn Shopping Mall, and Amarin Plaza. Free WiFi is available. The guest house will provide guests with a microwave, a kettle, a bidet, free toiletries, a flat-screen TV with cable channels and DVD Player. With a private bathroom fitted with a shower and a hair dryer, rooms at Pratunam Casa Hotel also feature a city view. All rooms come with a seating area. Speaking English and Thai at the reception, staff are always on hand to help. Siam Paragon Mall is 2 km from the accommodation. Don Mueang International Airport is 23 km from the property.